Situated in the northern part of India , Jammu and Kashmir is the essence of everything that is Indian-its culture, history, tradition, people, and natural splendor. Jammu and Kashmir are really three regions: the foothill plains of Jammu; the lakes and blue valleys of Kashmir rising to alpine passes, the high altitude plains and starkly beautiful mountains of Ladakh, which lies beyond those passes. It's enough to move one to poetry. Srinagar is Kashmir's summer capital and Jammu , the winter capital. Among the most attractive part that this Indian state has is the adventure opportunities that can be segregated into trekking, mountaineering and Trans Himalayan Jeep Safari.What can make a mountaineering expedition, an adventure one could never forget? If its done on the glaciers that are still craving to be explored. The Himalayan range offers some of the most rigorous mountaineering challenges one can ever come across. The glaciers of Ladakh and Kashmir regions can test one's survival to the fittest and most testing of them all is the Siachen glacier, known as the largest glacier outside the Polar Regions . Three Main Regions : Jammu , Kashmir & Dogri,. Kashmir is one of India 's most beautiful and touristically popular regions and has been since the time of the great Moghul emperors. 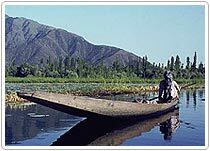 It's probably most famous for the houseboats on picturesque Dal Lake you've not really been to Kashmir until you've not really been to Kashmir until you've stayed on one - but there's a lot more to the Kashmir Valley than just lazing on board. Jammu , the second largest town in the state of Jammu and Kashmir , and is situated 290-km from capital city of Srinagar on the southeastern slopes of the Shiwalik range. In winter it becomes the headquarters of the Jammu & Kashmir administration and many Kashmiris move here for the winter because the temperature drops.